Giorgos Tsiatsoulis - accordion, Nicholas Miaoulis - jew's harp. 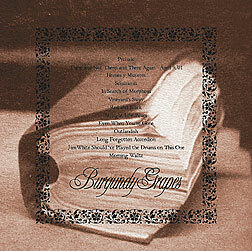 The debut self-titled album by Burgundy Grapes is the first for OUTLANDISH RECORDINGS, a new Athens-based label. Releases by both Greek and foreign acts will cover the fields of post-rock, acid-folk, alternative songwriting and innovative recordings, while the label's catalogue will also include live recordings from the Small Music Theater in Athens. The album's thirteen instrumental tracks document an eight-year musical course - one loaded with nostalgia - by two musicians, George Kolyvas and Alexandros Miaoulis, who delve into expressive forms ranging from post-rock and alternative country, to film music carrying qualities reminiscent of Yann Tiersen, as well as charming Ionian Islands-influenced balladry lost in reverie. Uncontrived and indifferent to market trends and obligations, the musicians deliver work that's authentic, honest, and direct. Despite its appealing nature, the material remains adamantly alternative. Repetitive melodic themes that serve to remind of Penguin Cafe Orchestra, Hadjidakis-type classical guitar-mandolin-metallophone arrangements, cello passages, and Road-Movie slide guitars echoing the work of Ry Cooder comprise just some of the traits of the music by Burgundy Grapes.